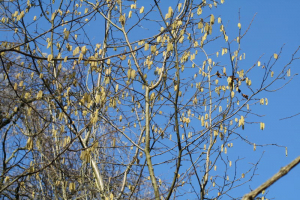 Observation - Hazel tree with catkins - UK and Ireland. Description: Hazel trees with male catkins in Gravel Pit Coppice Hatfield Forest. Male catkins, appear in Feb/March in yellow tassels about 6cm long. Hazel trees with male catkins in Gravel Pit Coppice Hatfield Forest. Male catkins, appear in Feb/March in yellow tassels about 6cm long.